We have the best and straight answers. The answer is BIG NO! If you think that Crocodiles are Dinosaurs, then you might be wrong. Although crocodiles and dinosaurs have so many similarities, but Crocodiles are NOT Dinosaurs. Crocodile are direct descendants of thecodonts. Both Dinosaur and Crocodile are cold-blooded animals and reptiles. They also have another similarities like fierce teeth and claws and of course their rubbery skin. So, we can conclude that Crocodiles and other reptiles aren’t dinosaurs. The family of crocodiles, separated from the animals that evolute became the Dinosaurs hundred million years ago. 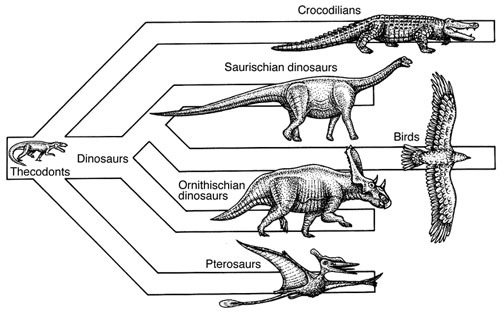 Dinosaurs and Crocodiles are different animals that lived in the same time. For hundred million years, dinosaurs finally evolved into warm-blooded and covered with feathers. The Crocodiles remained cold-blooded and scaly. Dinosaurs evolved into birds, and Crocodiles are still crocodiles like we see today. I hope this article help you to solve your problem. Now you know that Dinosaurs aren’t Crocodile, vice versa. They’re so close, but they’re different.